The blog of Staffordshires First Poet Laureate. DOUBLE BOOKED IN A FORTY YEAR OLD LIBRARY. WHAT ANNOYS – DELIGHTS – AND IS OFTEN UNEXPLAINED. What is ANNOYING me this week? What is DELIGHTING me this week? Poem – The Magic Box – Daniel Dewhurst. The last few weeks has seen my spare time taken up with writing for Quadrophenia in Tamworth along with preparing the specifications for the projections, exploring the sources of film footage of London and Brighton in the 1960’s. I am amazed as to how much I was able to find, especially cine footage taken by amateur filmmakers. In the past much of this footage would have sat in dusty box, lost at the back of the loft. But with the advent of sharing sites such as YouTube and Vimeo, many of these amateurs are sharing their films and in doing so are opening up a view of the world that we would not otherwise have. Whilst I am talking about film, I have completed the film I made with Keith Large, Double Booked. Using Keith’s script we originally shot this in January 2012, but due to issues with the performances we decided to re-cast and re-shoot last Summer. The film featuring Nic Adams as Bob Heap the Hotel Night Porter and Joanna Linford as Nina Cole the hotel guest with an unwelcome man in her room, plays out to show that this night porter is always going to be on top. Bob Heap (Nic Adams) and Nina Cole (Joanna Linford) in Double Booked. The final edits were made over a weekend and the completed film passed to Keith for him to promote and enter into film festivals. We uploaded it to the Withoutabox website and I left Keith trawling through what seemed an endless list of film festivals around the world. So let’s hope that Keith has some success, If I hear any more then you’ll be the first to know through this blog. Meanwhile back to Quadrophenia, the rehearsals progress to bring this new piece to fruition. I say new piece because the script is completely new, following the themes of Mod sub-culture, exploring attitudes to mental health, fashion and identity and the frictions of intergenerational relationships. My workshop at the Landau Forte School in Derby introduced POETNAV to the pupils who gathered word lists based upon the themes we explored. POETNAV is my SATNAV to help guide young poets to create interesting, engaging lines of poetry. It was really fantastic to see them create poems with great turns of phrase and imagery. I am greatful Jo Henchley and the other teachers and pupils who made me so welcome. There is some great literary potential at the school and I suspect every school, if we can just nurture it. My Laureate Saturday in Lichfield saw a few people come along to talk to me about my poem, All around the Shire and particularly the verse for Lichfield, which the consensus seem to be that the verse I had written captured the essence of the City and therefore it did not need to change. way to seek the Trent. as the poet swan glides the minster pool. the tombolas, the writers, the Jazz. and Earls gave halls to the Nations trust. I much appreciated those who came along, it was good to talk to people about poetry and how it can capture their imagination and enhance their daily lives. My next Laureate event is a reading at the Stafford Open Arts Forum at the Shire Hall Gallery on 17th May. Followed by my Quadrophenia commission on 24th and 25th May. – I may have mentioned it. The 8th June sees my contribution to the 40th Birthday celebrations at Tamworth Library. The Library moved into its current building in 1973 and has seen many changes in the last 40 years which we will discover with this wonderful opportunity. The library was built in a churchyard and architecturally is very much of its day. This free poetry workshop will explore some unusual, quirky features of the library collections and its building as selected by the Library Staff. It could be the least borrowed book, the oldest book, a feature of the building, something that is under appreciated or hard to like, I have left it for the staff to decide and to present to the participant the reasons for its selection. Anything could be selected here and it will beg the question if Tamworth Library has these items then what do other libraries have that defines them. Through exercises we will develop poems for a reading in the Library at the end of the workshop. The workshop is sponsored by Poetry on Loan whose support and promotion of Poetry events in Libraries is much applauded and appreciated. I am really looking forward to seeing the things that have chosen as defining Tamworth Library. Please contact me at maldewhirst@yahoo.co.uk or contact the library, if you want to reserve a place. Last night Thursday (25t April) saw the performance of Thrasher at the Brewhouse in Burton. Thrasher was conceived and written by Conor Mckee and saw six characters whose lives become mixed and intertwined on one night through deceit, betrayal, debt and lonliness. The play was directed by Wyllie Longmore and featured a cast of exceptional actors whose delivery and timing made the situations a reality. The cast was strong with all players giving this excellent script the justice it deserves. 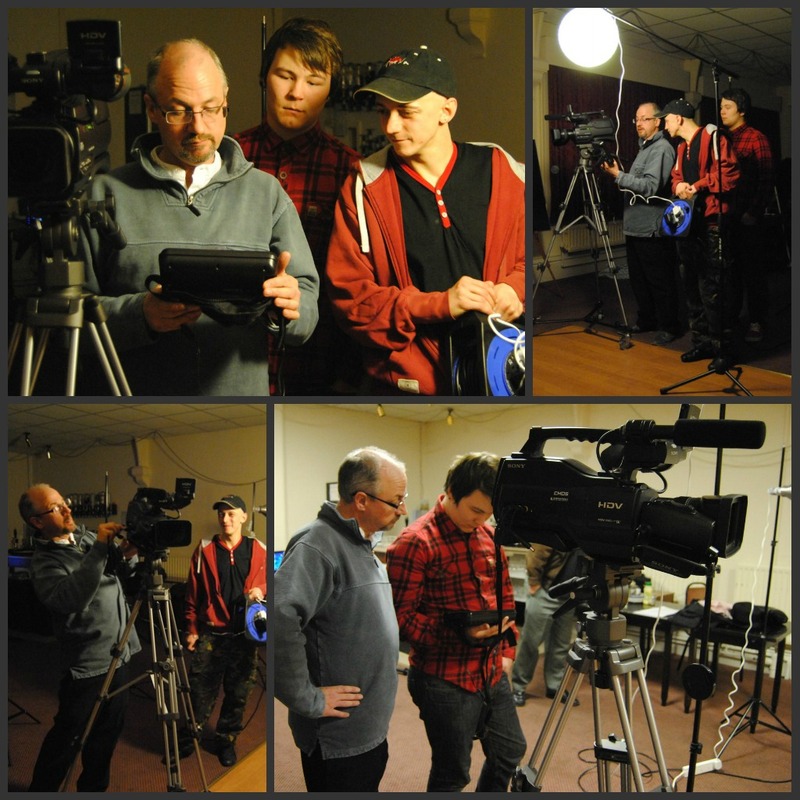 Conor came and visited the Runaway writers group a few weeks ago and shared a brief video trailer for the show asking us to write a brief response which would be work shopped with two of the actors prior to the show. My piece just entitled Response to Thrasher, really only picked up on the backdrop of a drawing of a rubber plant and a standard lamp, playing out a scene of perceived external threat, feminine manipulation, frogs in pans of water and the word mysandry. This was a fascinating opportunity to see professional actors work their way through the script looking for meanings and motivations, turns and tribulations in determining how best the stage the piece. More theatre companies providing these opportunities to writers would be more than welcome. Darren John Langford (Hollyoaks), Conor Mckee (Writer) Lauren Thomas (Waterloo Road) workshop my response to Thrasher. 7th May – Night Blue Fruit – Coventry. 14th May – Poetry Alight – Spark Café – Lichfield. 17th May – Open Arts – Shire Hall Gallery – Stafford. 8th June – Laureate Saturday – Tamworth Library. Morrison Hotel – The Doors. As the first Staffordshire Poet Laureate, I am finding my way to best give my service to poetry and the communities of this great creative county. As part of the role I have to undertake at least four commissions, two of which I have to bring to the role. My first commission was one that I found, “The Colin Grazier Enigma” poetry play which I was commissioned to write by Tamworth Borough Council Arts and Fired Up Theatre. The performance was an outdoor promenade play with a new musical soundscape and took part on 30th October 2012 to commemorate the 70th Anniversary of the events it described. The play received great reviews and photo coverage in the local press, including a piece on BBC television Midlands Today. My second commission came from Staffordshire Libraries and Arts to write an uplifting poem to promote the county, the poem Thinking Staffordshire was first presented to the Staff Conference in November. The poem considers all the creative facets of the county through the mottos of some of the leading organisations whose home is in the county. I will include the poem as part of my laureate readings in the coming months. So barely a month into my laureateship and half of my commissions had been completed, which was a good job really as the events unfolded with my health, which I am glad to say is something that is now under control and I can focus on enjoying my time as Laureate and new commissions and events. 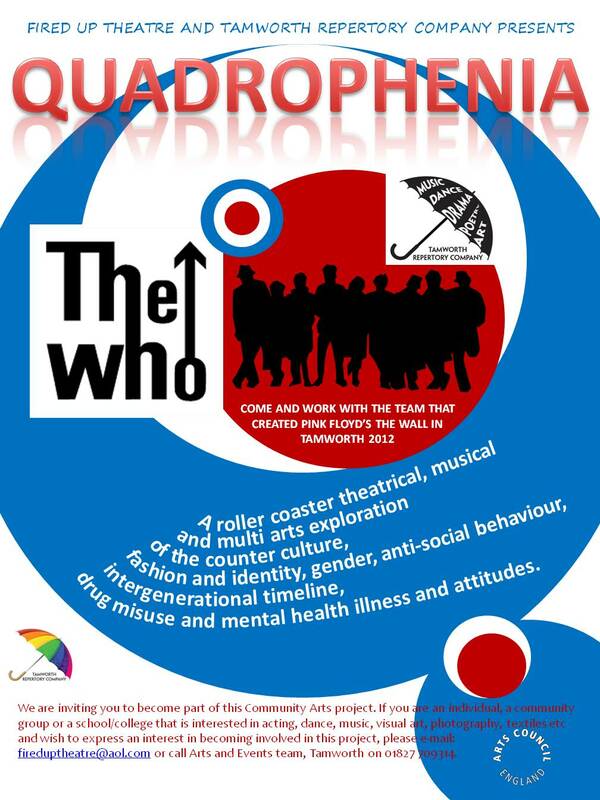 My third commission is well underway with my contribution to the new working of Quadrophenia being staged at the Tamworth Assembly Rooms on 24th and 25th May. The script which has been developed and written by Simon Quinn, has scenes that Simon left open for me to develop poetry to fit with the themes of mental health, fashion and identity, inter-generational friction, gender, drugs and anti-social behaviour in the 1960’s counterculture. My poems have developed as sequences taking on the different personalities of the helpless dancer, the romantic, the lunatic and the hypocrite. The scene under the pier will see these personalities acted out through the poetry. There will also be poems as projections. My role in the production in addition to writing, sees me co-directing alongside Simon, which at the time of writing sees us in a heavy rehearsal season to bring the piece to fruition. Plans are also in place for further commissions based around events at the Shire Hall Gallery in Stafford, which I will talk about in further posts on this blog. These events will take place on Saturdays in libraries around the county – these will include readings, an exploration of my All around the Shire poem and some 15 minute workshops. Below are the dates of the planned Saturdays more will be added as and when they are agreed. Lichfield Library – 20th April 2013 – 10:30 to 12:30. Tamworth Library – 8th June 2013 – Times to be advised. Last Tuesday was the 400th Anniversary of John Donne writing his poem Good Friday 1613, Riding Westward. Donne had left Polesworth on the morning and was heading to Monmouth, but his thoughts were tormented by his business in the west taking him away from contemplating the events at Calgary in the east. The evening saw the reading on four commissioned responses to the poem, from Gregory Leadbetter, Jacqui Rowe, Jane Commane and myself for which I wrote Good Friday 2013, Writing Westward, taking as my theme the commercialisation of Easter and all that takes our thoughts away from the real meanings of the events on the hill at Calgary almost 2000 years ago. My thanks go to Jonathan Davidson of Writing West Midlands, Dr Gregory Leadbetter, Dr Anthony Mellors, Dr Anthony Howe and Dr Derrick Littlewood from City of Birmingham University. Jane Commane and Jacqui Rowe for their contributions and Fr Philip Wells. Conor McKee is a Manchester based playwright whose play Thrasher is playing The Brewhouse in Burton Upon Trent on 25th and 26th April. A gripping story laced with genuine warmth and vicious comedy. Six people spiral towards destruction over one night in the city. Once lost, can faith, friendship and love ever be recovered? 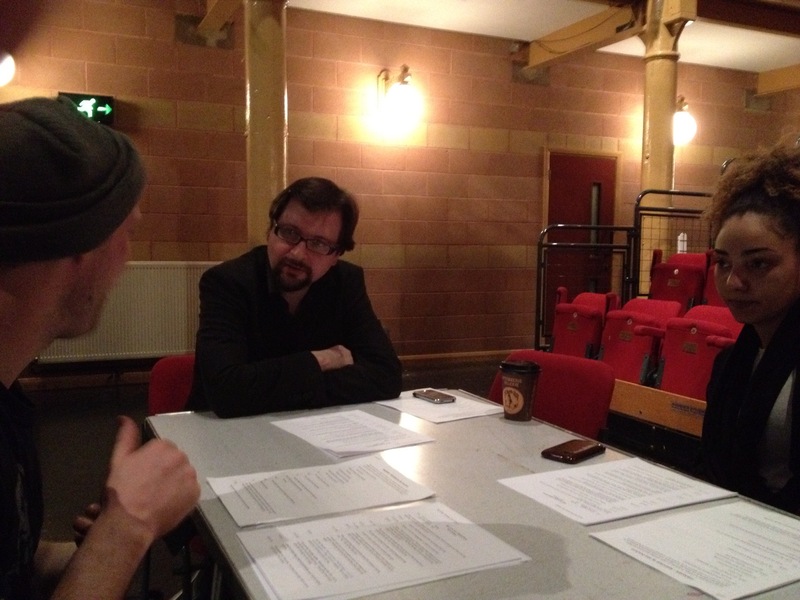 Conor has invited the Runaway Writers to create around 7 minutes of script to be work-shopped on the first night of the production in Burton. More information can be found at http://www.conormckee.com/ – Tickets are available from the Box Office at the Brew House in Burton. 20th April – Laureate Saturday – Lichfield. 26th April – Spoken Worlds – Burton On Trent.